The world's oldest operating bank needs a government bailout. Italy's Monte dei Paschi di Siena (BMDPF) said early Friday it's seeking "extraordinary and temporary financial support" after an effort to raise funds from private investors fell flat. The Italian government has been preparing for this situation by arranging a €20 billion ($20.9 billion) rescue fund to help prop up the country's struggling banks. But Monte dei Paschi didn't specify how much money it's asking for. It had previously tried to persuade investors to put in €5 billion ($5.2 billion), but political and economic uncertainty following the resignation of Prime Minister Matteo Renzi made many of them wary of signing on the dotted line. Any bailout plan would need approval from the European Central Bank. If it's approved, the Italian government won't be the only one whose finances would be affected by the bailout. Under new European rules, investors must take a financial hit before a government can step in with rescue money. That has raised fears that small-time, individual savers could suffer. But at a news conference early Friday, Italian Finance Minister Pier Carlo Padoan said the bailout for Monte dei Paschi would "safeguard" the interests of mom and pop savers and shareholders. The bank, which was founded in 1472, has roughly €28 billion ($29.3 billion) in bad debts that it has been trying to spin off into a separate entity as part of a turnaround plan. Its share price has plunged 88% since the start of the year. Trading in the bank's shares was suspended Friday. Based on the European bailout rules, junior bondholders are supposed to take a financial hit. But the Italian government said under the plan for Monte dei Paschi, bonds held largely by institutional investors will be converted at 75% of their face value into shares, while those held mainly by retail customers will be converted at their full value. The retail investors' shares would eventually be turned back into bonds of the same value as those they held originally, according to Padoan. The country's lenders are saddled with about €360 billion ($376 billion) in non-performing loans, roughly a third of the eurozone total. 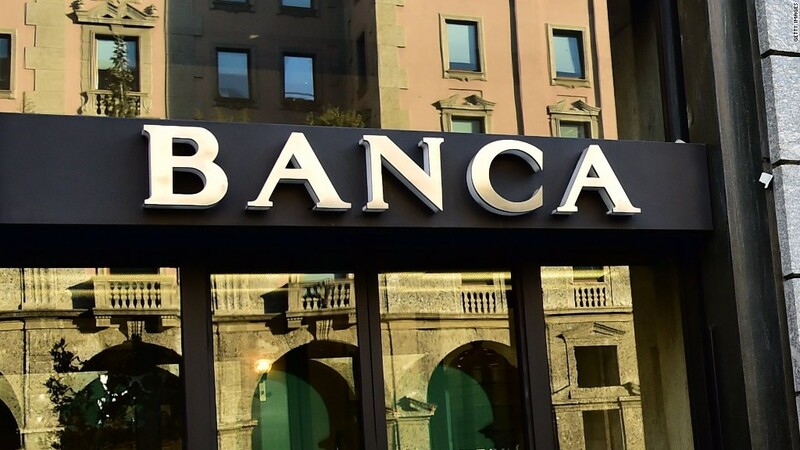 It's expected that a number of other small Italian banks will soon seek government help to rebuild their financial position. They'll also look to draw from the €20 billion rescue fund. Earlier this month, Italy's biggest bank, UniCredit, announced plans to raise €13 billion ($13.6 billion) and slash thousands of jobs to shore up its finances. --Chris Liakos and Marta Colombo contributed to this report.